The right hand of 'Mark Twain,' Plate XII, does not come out as clear as one would like. It was made by means of smoked paper, a process I employed in the earlier days of my career. I later substituted this with another process which has been described in Chapter 2, Part IV. The most remarkable things to notice in the impression of the right hand of this celebrated American humorist is that the line of head lies almost level across the palm. This characteristic is found on the hands of people who develop the faculty of' seeing both sides' of anything that interests them. 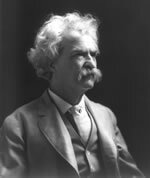 'Mark Twain' had this particular gift in a very marked way and which comes out strongly in all his writings. He was not a 'visionary' by any manner or means. If anything, he was an avowed sceptic and had to have facts to support his views or ideas. When he came to see me I did not know who he was. While I was taking impressions of his hands, he said: "The past may leave its mark, I admit, and character may be told down to its finest shades of expression; all that I might believe-but how the future may be even foreshadowed is what I cannot understand." In answer to his argument I took up the question of heredity. 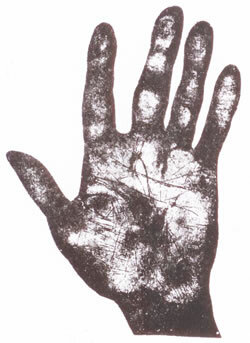 I showed him an impression of a mother's left and right hands with the imprints of five of her children's until we came to one where the right hand of the child tallied closely with the markings of the mother's right hand. "In this case," I said, "which you can follow up and prove for yourself, every section of this girl's life repeated, even to dates, the events of the mother's life, although twenty years separated them in -time." "Now," I concluded, "if one had known the events of the mother's life and seen that the same marking appeared in the hands of the child- then, even say at six years of age, one could have predicted the events which would take place in the fate of the daughter." As he was going he told me who he was and added: "The one humorous point in the situation is, that I came here expecting to lose my money by my foolishness, but I have gained a plot for a story which I certainly think should be a 'best seller'." A short time later he published Pudd' n Head Wilson, dealing with thumb-marks which had an enormous success. "Cheiro" has exposed my character to me with humiliating accuracy. I ought not to confess this accuracy, still I am moved to do it.